Earlier in the year I wrote about whether or not I would coach Darby's soccer team. I talked about my heart maybe not being in it and the need to work a few more hours a week to help ends meet. Truth be told, I had a season a few months prior that, because of a variety of reasons, had me questioning whether I could get myself engaged and not just go through the motions. I decided, or more specifically Darby decided for me, that I would be coaching her team this year so I put on my whistle and hoped for the best. Enter the Tigers. Saturday marked the end of the season for Darby's team and it wound up being one of the most rewarding coaching experiences I've had in any sport. The Tigers were a great team. But that statement comes with a caveat. A "great" team in U5 soccer is not one that scores a phenomenal amount of goals or plays tenacious d. A great U5 team is one that listens a good portion of the time and seems to absorb a small percentage of what is being thrown their way. A great U5 soccer team become friends as the season goes on and has a group of kids who want to play together on and off the field. Every season you have at least one "problem child". A kid who won't listen, or a kid who solves their disputes with their hands rather than their words or who cry over almost spilled milk. Every season there are at least a parent or two that see U5 soccer as a springboard to the Olympics or to a college scholarship and treat it with that amount of seriousness. Every season, that is, until this season. Sure there were a couple of kids who didn't keep their eye on the prize while on the field. Honestly, Darby was one of those kids this season. 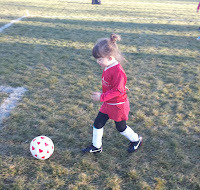 She was as likely to be looking for flowers on the field as she was to be looking for the ball. I recognize something in that kid. Maybe it's the 8 year old version of myself who picked innumerable dandelions in right field. 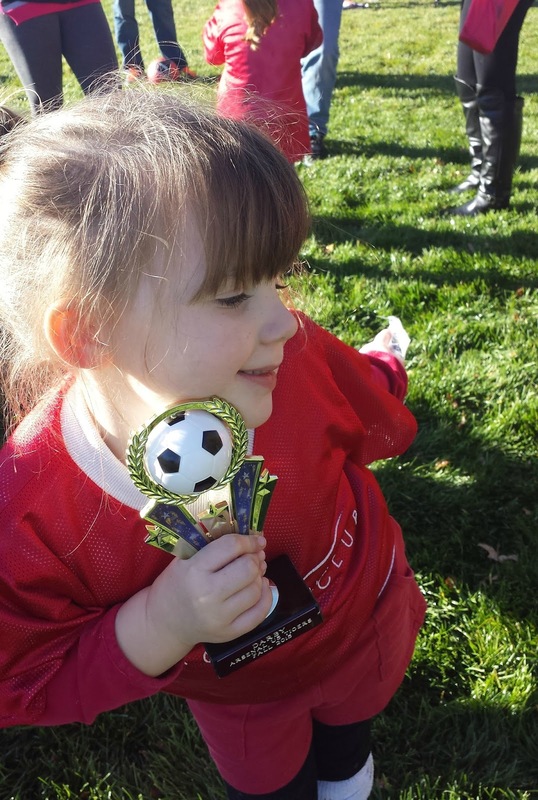 The goal of U5 soccer isn't to create great soccer players, it is to show kids what a team environment looks like and hopefully create an experience that has them wanting to try again next season. The goal of coach, as silly as it may sound, is to help kids who are quiet come out of their little shells a bit and the kids that appear to lack a shell at all, help them learn to reel it in a little when the situation dictates. If that is the goal, I think this year's team achieved it. The point of the story, girls, is this: don't miss out on things you may love because of your own preconceived notions. I was ready to hang up my whistle for good because of a group of parents a few seasons ago. Had Darby not talked me out of it, my last experience with coaching would be a season where I wasn't fully committed and where I was ready for the season to be over. Instead, I wound up coaching a great group of kids and dealt with a great group of parents. It was a revitalizing experience that I would have missed out on had I listened to the voices in my head instead of the voices at my dining room table. So thanks Darby, thanks to the 2015 Tigers, thanks to a great group of parents and as always...Gooooo Tigers!